Small game arrow heads for squirrels are different from most because we are usually shooting up. Up means losing arrows when we are bowhunting, and Snaro small game arrow heads may be the answer. One of three things will happen when you try take a squirrel out of a tree. You either hit the squirrel (this is good), you miss everything and the arrow is lost 300 yards away, or you bury your arrow in the tree 40 feet up. All three results can mean a $10 arrow lost forever, and an expensive day in the woods. 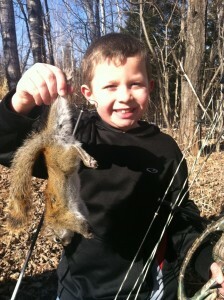 Snaro small game arrow heads for squirrels can be the answer for all 3 problems. Your Snaro tips are big enough to grab leaves and limbs when they blow past the squirrel, falling to the ground where you can find them. If the canopy is fairly established you will get you arrow back in the quiver to ride again. If you do hit the squirrel, your KE is transfered to the vermin, and he ends up in your game bag with no holes in him. That’s better for the crock pot. And finally, if you aim low and hit the limb he is sitting on, the blunt design will have the arrow bounce back and into your grasp for a retry. Snaro small game arrow heads in the 2 or 3 inch size are your best bet for squirrels, and should be shot from recurves with a 55 lb draw weight and compounds of any weight.